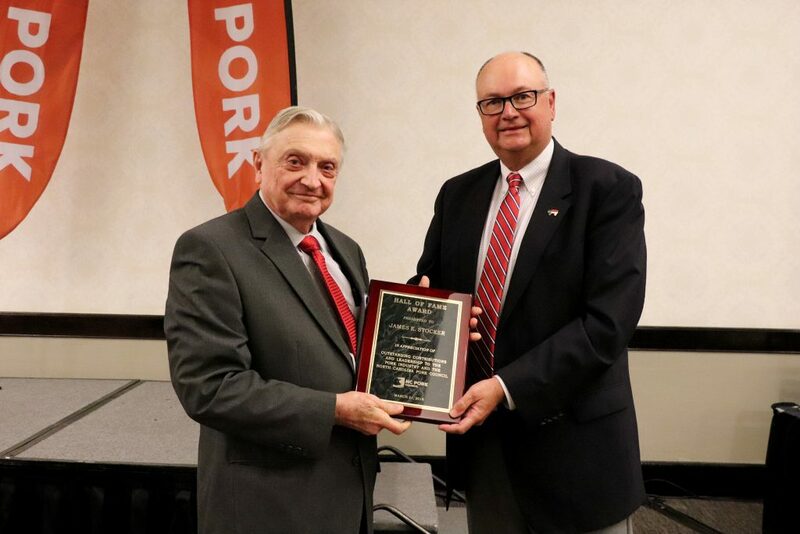 The North Carolina Pork Council’s Hall of Fame is the highest honor bestowed by the organization, one reserved for outstanding lifetime achievement and contributions to the industry. This year’s recipient, Jim Stocker, has indeed had a lifetime of outstanding achievements and contributions to our industry and state. Jim was born in Tennessee and graduated from the University of Tennessee in Knoxville with a business degree. Out of college, he quickly proved he was adept with numbers and business understanding and acumen. He was a finance and credit manager at a feed mix company in South Carolina in the mid 1960s when he first met Wendell Murphy. Murphy was working to grow and expand his hog farming efforts in North Carolina and Stocker was able to see the potential in the Murphy Farms venture and provided the funding needed. In 1973, Stocker moved to North Carolina to work with Murphy Farms. That move placed Stocker at the forefront of the Murphy enterprise – one he would help to propel to new heights. Stocker held various titles over the years – executive vice president and general manager, president and vice president to the board, among them. But there is no title for the years of hard work and focus that were needed to build a successful enterprise that has had a significant impact on North Carolina. Stocker worked with NC State University researchers to design and refine confinement buildings that made economic sense and are still in wide use. He was involved in the development of “The Chief,” the largest capacity feed mill in the world, right there in Rose Hill. Jim helped steer many cost-reducing technological production changes, including the development of all-indoor, three-site production systems. And he authorized and advanced numerous research and development efforts aimed at exploring the opportunities in energy and nutrients from manure, an area where there have been recent breakthroughs. Put simply, Jim Stocker was an architect of much that Murphy Farms did to develop and expand in North Carolina – and beyond – and to achieve success that brought benefits and economic activity to a broad region of the state. When Murphy Farms merged with Smithfield in 2000, the company was producing 6 million hogs per year, had more than 1,500 employees and more than 1,000 families in contract growing partnerships. Jim Stocker was a big reason for that success, and Wendell Murphy credits Jim for being the man who made things happen. Jim was also involved broadly in the industry and community as well, serving with state and national trade organizations as well as on local boards.